Since Apple introduced its iPhone followed by the iPad, we have seen a burst of touch screens out in the market. The list seems endless! More and more little heard companies are putting out their own versions of the iPad’s and the tablets but how many of these are really worth looking at? Is it safe for us to say that its getting a little annoying? eviGroup has come up with its Android powered Wallet called the MID. The MID is officially shipping and is priced to about $245. 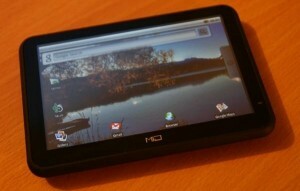 The MID has a five-inch, 800×480 resistive touchscreen running Android 1.5. With built in 1GB storage provides enough space for basic tasks. A microSD slot is also available for additional storage. The device runs on a 667MHz Samsung ARM processor and the battery is to last for about six hours. The device does not include GPS nor Google maps which does not really make this useful if you on the move. It does come with a in car hook up but the best use for this device in the car is for entertainement. There is surely a great deal of success being shared by chip manufacturing companies. As they see all these device makers scramble for Samsung ARM processors and Intel Atom processors. Not just that good news for Android, another device under its belt! For another $200 bucks you can walk out with a nice iPad with loads of features and 16GB of storage space.